She was sent home having waited for a number of hours in A and E and had now swollen too much for being put in a cast. Within 12 hours she was attended to by Cosmodic. Her sessions were administered on a twice daily basis over 3 days. Day 2 Before and After Treatment. Day 14 Before and After Treatment. After the first session the swelling had reduced 75%. Following the second session the bruising had entirely come out. following the 4th session her mobility had greatly improved. following the 6th session 95% of the bruising had gone and mobility had returned to normal. There was no pain at this point in time with or without the influence of Cosmodic. 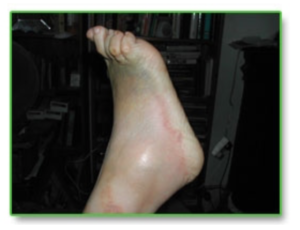 She was returned by ambulance to the A and E department for X-ray and it was confirmed that there was no longer any fracture of any kind or damage to the ankle at all – in fact there must have been some mistake! She reported at that time that there were a number of other concerns that appeared to have disappeared also, namely eczema that she had experienced for more than 30 years between her fingers, plus tinnitus in both ears as well as a major improvement to chronic asthma that she also had suffered for many years. There was a marked improvement with arthritis in her upper thoracic spine and shoulders i.e. she was now able to lie down flat to sleep as opposed to setting up with 4 pillows. She could also walk unaided where as for years she had used 2 sticks. Her feeling of well being and vitality recovered to that of past 20 years.